국가수리과학연구소 수학원리응용센터에서는 아래와 같이 NIMS 콜로키움을 개최합니다. High Performance Computing (HPC) is becoming ever more important as a research tool in many surprising areas. The use of HPC in modeling complex physical phenomena such as weather, fluid dynamics, molecular interactions, astronomical calculations and engineering design is well known to researchers in those fields. The main usage of the HPC in the research make through the simulation codes which is the topic of the computational science and engineering (CSE). The CSE is a rapidly growing multidisciplinary field that uses advanced computing capabilities to understand and solve complex problems. It combines applied mathematics, computer science and scientific or engineering applications. As the architecture of HPC is more and more complex and more sophisticated numerical algorithms are required, mathematical analysis and researches are became more important. In this requirement, Max Planck institute for Plasma Physics (IPP) whose main aim is to develop a fusion reactor recently installed new department Numerical methods for Plasma Physics (NMPP) for developing and analysing numerical algorithms. 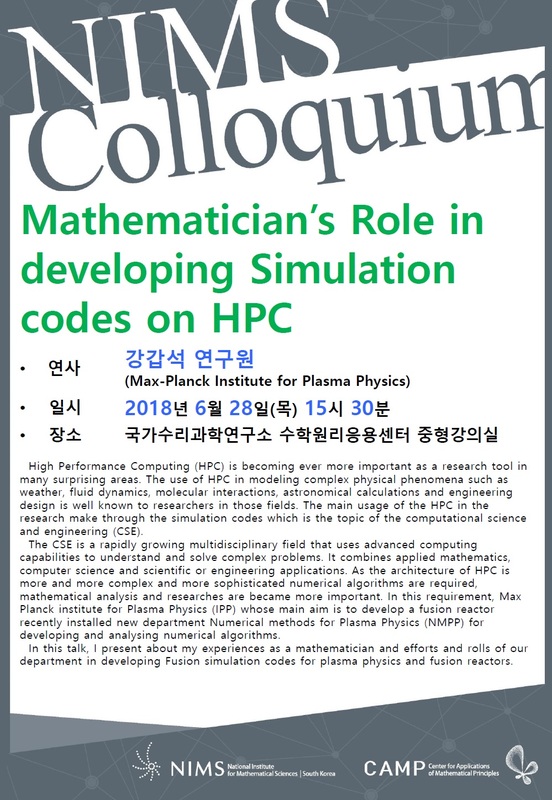 In this talk, I present about my experiences as a mathematician and efforts and rolls of our department in developing Fusion simulation codes for plasma physics and fusion reactors. ※ 연구원, 교수, 학생, 기업 관계자, 일반인 등 누구나 참석이 가능합니다.